I have lived in California for 28 years, but never visited any of its national parks. When the opportunity presented itself to visit three parks in three days via the Majestic Mountain Loop, I jumped at the chance. As a national park virgin, I literally had no idea what to expect. And, as a single mom, trekking off to the wilderness with small children was a little intimidating. So, I did what any mom who’s traveling to an unfamiliar place with small children would do, I scoured the internet for tips. For the most part, everything I read was helpful, but what really threw me off were the park’s elevation levels. I couldn’t figure out if the areas I’d be visiting would be sunny, rainy, or snowy. Turns out they were all of the above! Long story short, if you’re visiting between seasons—not quite winter, not quite summer—be prepared to pack half your child’s wardrobe. TIP: October and May are great months to visit. The Majestic Mountain Loop is the journey between Sequoia, Kings Canyon, and Yosemite National Parks. Really, it’s more of a Majestic Mountain line—Kings Canyon is between Yosemite and Sequoia National Parks. Your journey could start at either end of the line. I live in Northern California, so my adventure began with a quick overnight in Visalia at Comfort Suites Visalia—an economical choice that offers free breakfast in an old-timey historical downtown area about an hour’s drive from Sequoia National Park. If you’re a fan of giant roadside oddities—and who isn’t?—just south of Three Rivers is a giant bull/pomegranate juice stand. Say What! Visit our Yosemite Landing Page! Sequoia National Park is full of wonders. Perhaps you’ve heard of General Sherman, the world’s largest living tree, or the park’s infamous Tunnel Tree Log? A friend at Trekaroo told me that park visitor centers are great information sources, especially for newbies like me, so I swung by Foothills Visitor Center to ask a park ranger about the driving conditions to Moro Rock, a granite rock with a stone staircase leading to the peak that sits at over 6,700 ft.—an exhilarating heart-pounding experience! Don’t worry mom, the trail has railings to keep young children safe, kind of. Though similar in appearance to Sequoia National Park, Kings Canyon National Park offers its own unique brand of family fun. 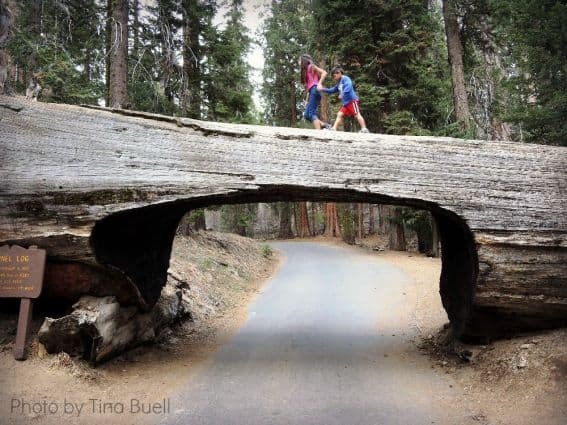 A 1/3-mile loop through a grove of towering sequoias on a paved trail around the General Grant Tree—the third largest tree in the world—offers unusual opportunities to walk and climb through the Fallen Monarch, a giant fallen sequoia hollowed out by fire over a century ago. Other features along the trail include Gamlin Cabin, one of the original ranger stations when the park was first established in the 1890s. From Kings Canyon, it’s a 4-hour drive to the southern entrance of Yosemite National Park. Family-friendly overnight lodging choices include Best Western Plus Yosemite Gateway in Oakhurst, Pines Resort in Bass Lake, and Tenaya Lodge in Fish Camp. During our stay at Tenaya Lodge, a luxury mountain resort, I scheduled an archery lesson for the kids and it was a HUGE hit! Even my ADHD 5-year-old was laser focused on the lesson. Afterwards, we enjoyed a daytime nature hike on a self-guided trail. It was a great family bonding day! There were many activities we didn’t get to try since we were only there for a night. Had we more time, the kids would have liked to experience the resort’s rock wall climbing and guided evening flashlight hikes. Spending just one day in Yosemite National Park is like eating just one Pringles chip, you only get enough to know you want more. In our brief but eventful time at the park, we drank in the majesty of Tunnel View, a gorgeous beyond words scenic overlook offering extensive views of Yosemite Valley. 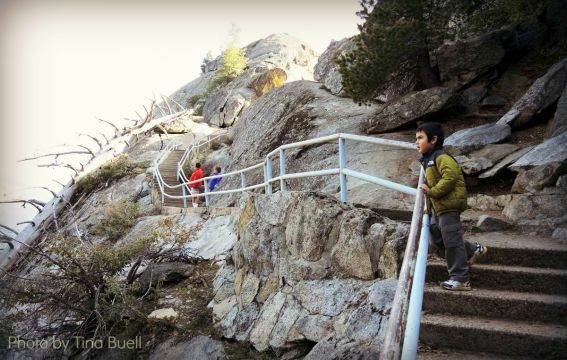 We explored Bridalveil Fall, a towering waterfall accessed via a stroller-friendly trail, and we parked at Curry Village to take advantage of the park’s free shuttle which runs on a continuous loop through the valley. In the village, we encountered deer grazing within arm’s reach! Allowing for a bit of spontaneity in our day, we hopped off at shuttle stop #17/Mirror Lake when we heard the shuttle driver mention that Mirror Lake’s two-mile round trip stroller-friendly trail is perfect for families with young children. Unfortunately, approaching nightfall forced us to turn around before we reached the lake. Our exciting day at Yosemite had come to a close and even though no one wanted to acknowledge it, it was time to go home. 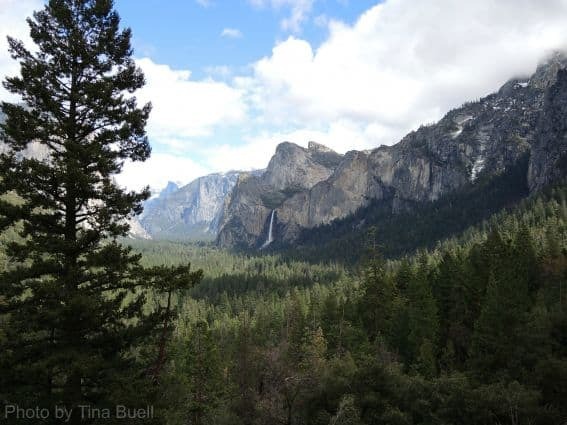 My advice for families planning to experience three national parks in three days is to extend your trip a few nights inside Yosemite National Park. You won’t regret it! Oh, and leave before it gets dark! Those winding mountain roads are no joke! 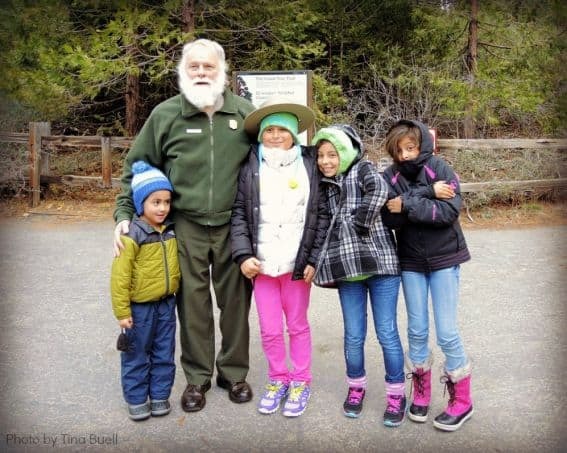 Check out our reviews of kid-friendly activities in Yosemite National Park! Disclosure: I received complimentary lodging and activities for the purpose of this review. I was not required to state any particular view. All opinions are my own. Awesome story of an amazing trip. Glad you aren’t a NP virgin anymore! Love the photos. I am happy to read your story! You do really have a awesome trip and i can see that you are enjoy. I love the photos, because i can see the happiness in your faces. Great post!